﻿ ﻿ ﻿ C. Harb's Rugs specializes in Persian Sarouk, kashan, isphahan (isfahan), heriz, tabriz, bokarra, mahal, hamadan, shiraz, kerman (kirman), bidjar (bijar) oriental rugs. An oriental rug is more like a fine work of art than a floor covering. Never the less, even the finest rug can be subjected to soiling and staining beyond the experience of lesser textiles over the duration of its lifetime, which is usually several generations. 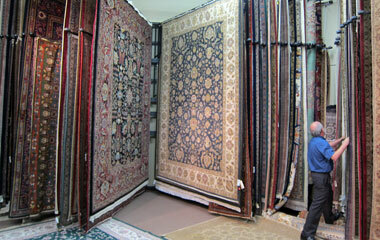 Never approach cleaning an oriental rug as you would a wall-to-wall carpet. 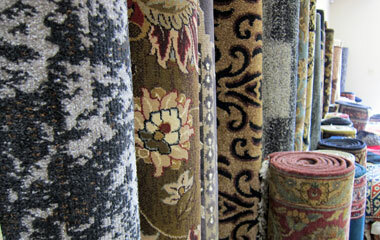 Unlike carpeting, a rug should be treated as more than a two dimensional surface, it is three dimensional. A professional oriental rug cleaner would never attempt to clean your rug on your floor. Our modern cleaning facility is located on premises, and we provide the most gentle, thorough cleaning available. We detail rugs literally on our hands and knees, and don't hesitate to redo any step in the cleaning process that fails to meet our high standards. After dusting, the wool rugs are washed with wool shampoo and thoroughly rinsed. The cotton fringe is washed by hand separately and rinsed, and the rug is thoroughly dried. After the rug passes the wash inspection, any stains that didn't wash out are individually tackled with specialty stain removers. Routine rug care at home includes regular vacuuming, which may remove 90-95% or more of particulate matter. The remaining 5% or so sinks deeper and deeper into the pile, eventually accumulating in the knots themselves. This loose sand, dust, and grit are our first priority in cleaning. Dusting rugs can be the most labor-intensive part of cleaning, especially among older rugs that have not been thoroughly dusted in recent years. We offer stainproofing and moth deterrent service options. Pickup and delivery available. This is a separate category, because standard rug cleaning will not remove pet stains. This type of staining has been traditionally designated as permanent by oriental rug cleaners, and many a rug has been considered ruined as a result. Even today, we invite you to contact oriental rug cleaners in your area and inquire about pet stain removal--most will tell you it simply can't be done. Pet stains are particularly difficult because they tend to cling to wool and cotton. Our research has uncovered enzymes and other biological agents that target the organic contamination pets can deposit and break them down to simpler chemicals that can be then flushed out of the rug. The use of enzymes does necessitate an extra charge and often extra time (it is a biological process), and though we cannot undo chemical changes the acids in the contamination may have caused to the rug's dyes, we can remove the contamination.